Vacation rental condominium. Sleeps 11, 2 bedrooms, 2 bathrooms. No pets allowed. Kitchen with stainless steel appliances. Living room with flat screen TV's, high end finishes along with designer touches will surround you in luxury during your stay!!! 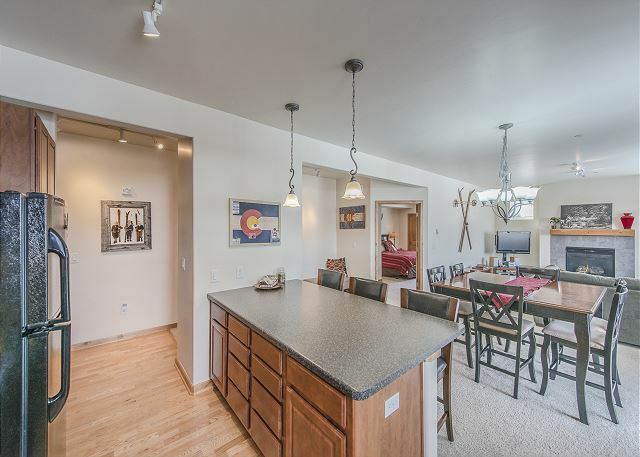 The kitchen has all amenities of home and will allow you to cook that gourmet meal that the whole crew can enjoy after a fun day on the slopes. 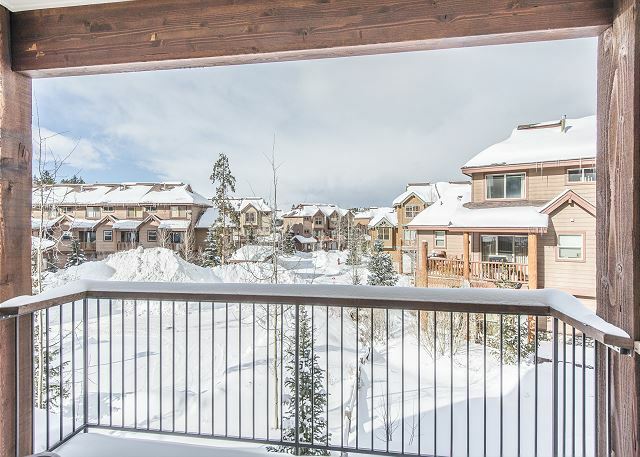 There is also a large private deck with amazing views of the river and continental divide. 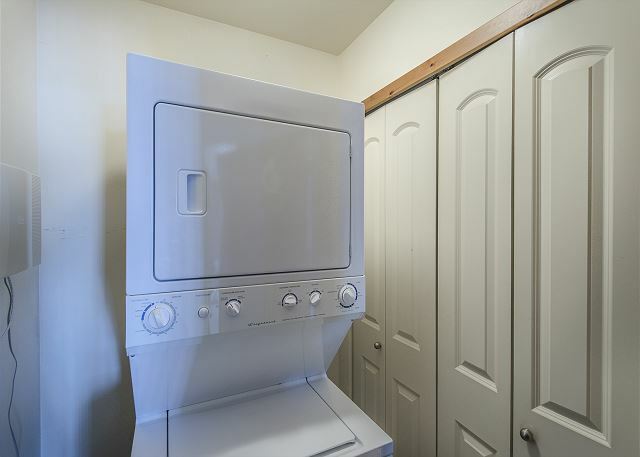 Private washer & dryer in unit. Master bedroom with king sized bed. 2nd bedroom with twin bunk + full sized bunk. Living room w/sofa sleeper and ottoman that also folds out to a twin sized bed. Higher rates may occur on Saturday to Saturday reservations. Property does sleep up to 9 people - not intended for 9 adults (max 6 adults) For larger parties: We also have 6/SIX other 2 bedroom and a 3 bedroom at Trailhead Lodge! Thanks for staying with us. I will get some up to check on the remotes. Thanks for bringing it to our attention! Property description was accurate regarding the location, layout, and amenities. Property was fairly clean and well-maintained. The owner or manager provided good customer service. I would recommend this property to a friend or relative. We enjoyed the Winter Park summer activities (specifically Trestle Bike Park) and Rocky Mountain National Park. Sounds as if you took full advantage of the fresh mountain air. Thanks for your feedback Laura and please keep Winter Park Management in mind for your next adventure! We would love to have you back again. Take care. 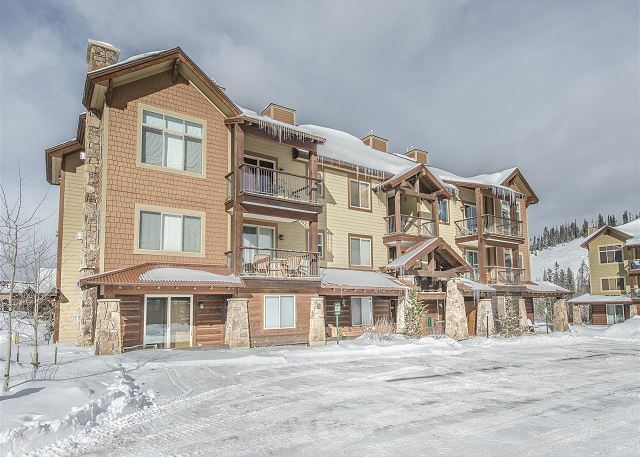 Very neat and clean, close to Winter Park Resort. Right next to Fraser Park Amphitheatre. This was a great condo for our family of 5. Thank you Caroline for taking the time to leave us your feedback. We really appreciate that. We are a family of 5 as well and glad it was accommodating to your large size family. Lots to do in the mountains and I'm sure you made some great memories for everyone. Please keep us in mind if you are ever in Winter Park area again. Love to have you back! This was our 3rd stay here and we just love the place. Located within walking distance of down town. Nick and Charlotte are great to work with. Thank you Todd for continuing to choose Winter Park Management during your stay in the mountains. We appreciate your business and thank you for always taking such excellent care of the property during your stay. Can't wait to see you again for your 4th visit. Take care. Great location, room for 11. 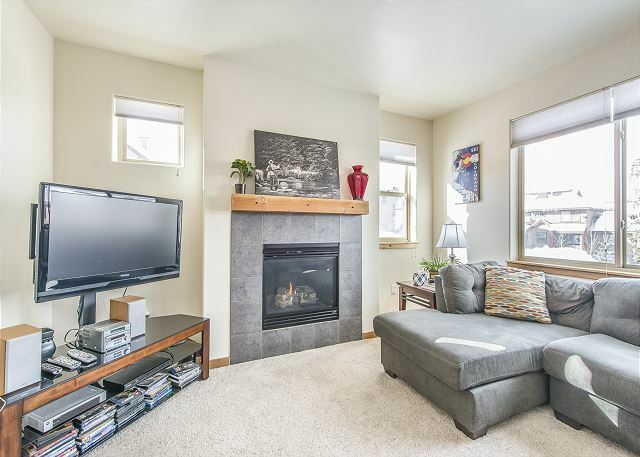 It was clean, stocked with everything you need; 1-2 average size families will greatly enjoy this rental. Thank you Jason for taking the time to give us feedback. We are glad you enjoyed your stay with Winter Park Management. We welcome you back again any time and look forward to your return. Take care. 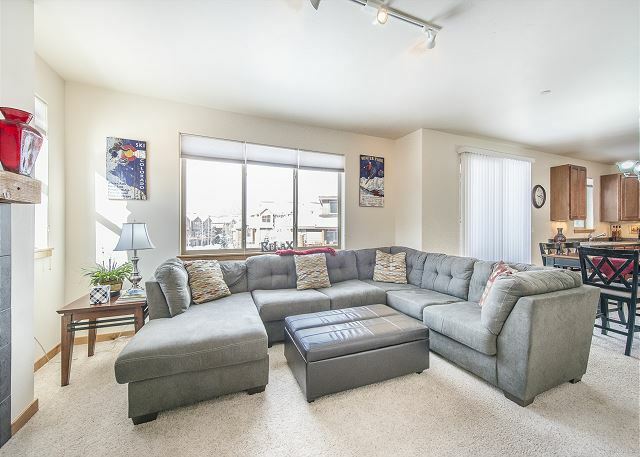 Not very often you can find a nice condo with enough beds for a large family with 5 kids. This one was a perfect fit for us. Clean and kids very much enjoyed the heated pool and hot tub. Can highly recommend booking with Nick & Charlotte. They were helpful from planning stage to the end of our stay. Called at 8 pm in the evening, and they still went out of their way to help us finding pharmacy nearby. Thank you for taking the time to respond to the review. We appreciate feedback and will pass along your kind words to all who made your stay enjoyable. Glad that the kids had a blast too. Please come back and visit us in Winter Park again soon. Take care and Happy New Year. Great unit! Nick helped me figure out the TV as I wasn't familier with the set up. This was our 2nd stay here and we plan to stay again next year. The unit was perfect. The only disappointing aspects were (1) the hot tub didn't work on our last night there, and (2) the rental agreement from the prior renters was on the kitchen counter and we could see we paid $200 more per night than they did. Thank you for the review! Prices for rent vary based on several factors. The renters that paid less than you rented for one night in between other stays and booked last minute, therefore the price was far less than the condo usually rents for. Condo was great! It was clean, nicely furnished, great location and great clubhouse. Thank you for taking the time to write about you stay! Trailhead is such a great complex. Hope to see you back on your next trip! Flew into Denver late at nite during a winter storm watch. I was able to contact the property managers and they advised us on the weather/driving issues. Thank you for all your help!!! We hope you had a wonderful Spring Break vacation! The snow plow crews do such a great job at keeping our roads up here clear and safe. Hope to see you back in Winter Park again! Loved the place! The ski bus picks up right outside the condo development - didn't need the car. Winter Park is one of the last true mountain towns with great dining and small movie theatre. The pool and hot tub are great! Priced right for one of the newest condos in WP. Thank you for the kind words! We love our little mountain town :) Can't wait to see you back again soon! Fit our (kid heavy) family perfect! Master was great and the 2nd bedroom with double bunks was great for the kids. Even the sofa and ottoman make into beds. Three Cable TV's and tons of DVD's was great for the non-skier in the family. Loved the local Art! Great rental for our ski weekend! Great rental! Very spacious and comfortable. Walking distance to town. Nice pool, hot tub, and common area with pool table and TV. Need to bring own shampoo, lotion, and soap for the bathrooms...would have been nice to know ahead of time. Thank you for the review! Trailhead is one of our favorite locations with that beautiful common area in the middle of the complex. Shampoo and soap is something we do provide. Next time just let us know if you need anything and we will have it right over. Hope to see you back again soon! Glad to hear you enjoyed the condo. We hope to see you back in Winter Park again soon! a guest from Katy, TX does not recommend this vacation rental. 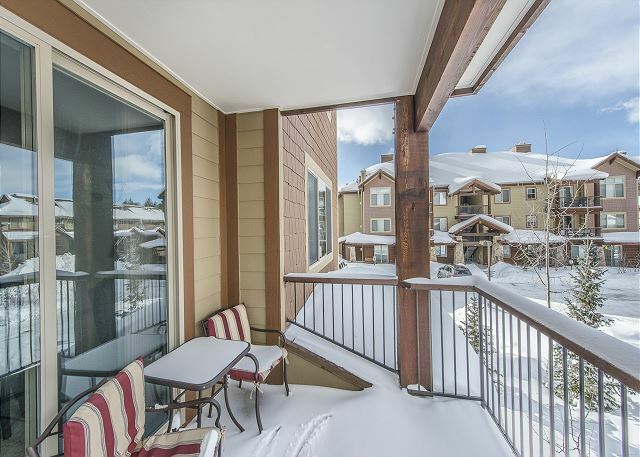 We've stayed in much nicer places in Winter Park for less money. I really wish I could give this condo a better review. It has great bones and could be excellent given some TLC (decorating, organizing, deep cleaning, etc). Appreciate you taking your time to write about your stay! I so wish that you would have contacted me while staying so we could have sent cleaners in to re-do the job they are paid to do. Feedback will be shared with owner of the condo in regards to the comment of unit needing some better decoration and organizing. Very fun. Now that I know the area next time we will stay in the village. Thanks for taking your time to write about your stay. 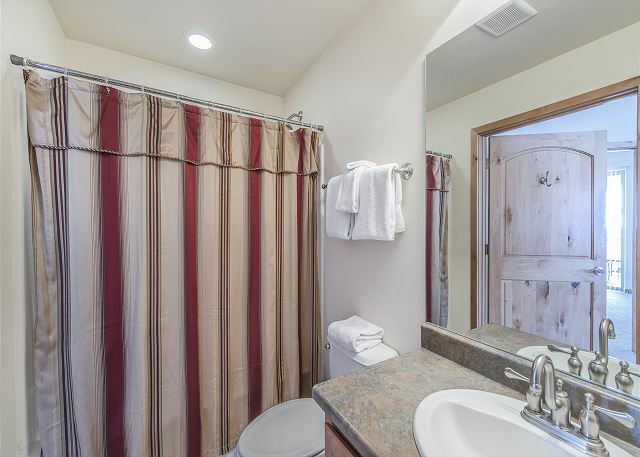 Happy to hear that you had a fun time while staying at this nice 2 bedroom @ Trailhead Lodge!!! Very nice new condo! Well furnished and decorated, clean, modern. Great location...right next to park where summer concerts are held. Short walk to restaurants and shops. Lock box with keys makes check-in/check-out very easy and convenient. Instructions and info provided prior to check-in were clear and complete. Roomy living room, huge couch. Could sleep 8 comfortably with king bed in master, 2 bunk beds (4 beds) in second bedroom, and pullout couch. Kitchen stocked with utensils and basics for cooking. Thoroughly enjoyed outdoor heated pool and hot tub in the snow! Only complaint is bathroom fans...would be a good upgrade...pretty steamy after a shower, and odors linger. But overall highly recommended. 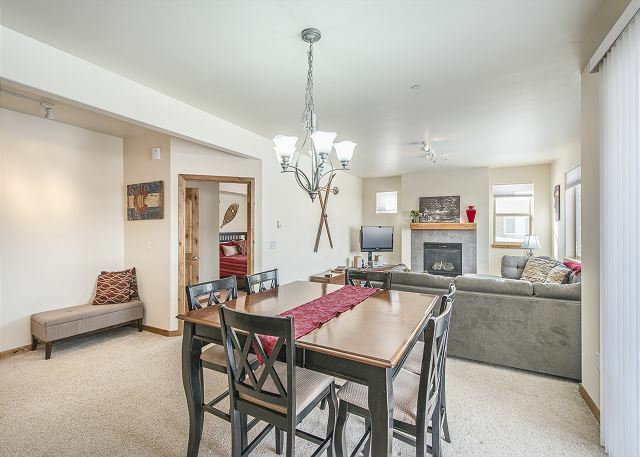 Thanks for taking your time to write about your recent stay at this nice 2 bedroom @ Trailhead Lodge. Appreciate all your feedback ....incl the bathroom fan request of upgrade.